Imagine my excitement. I have been looking for Baird’s Sparrows for several years, it will be a life bird for me. However, every field that I have explored within this species range has been empty of this gorgeous little sparrow. My dear friend, Julie Zickefoose, was leading a birding trip in North Dakota — maybe she has found this elusive prairie species. A quick text query receives an equally quick reply that she had indeed found a singing male. Excellent directions lead me right to the patch within a large pasture of apparently native prairie that was being grazed by a few cows. Within minutes I was hearing the soft, tinkling song of a Baird’s Sparrow drifting out of the darkness — a lifer! 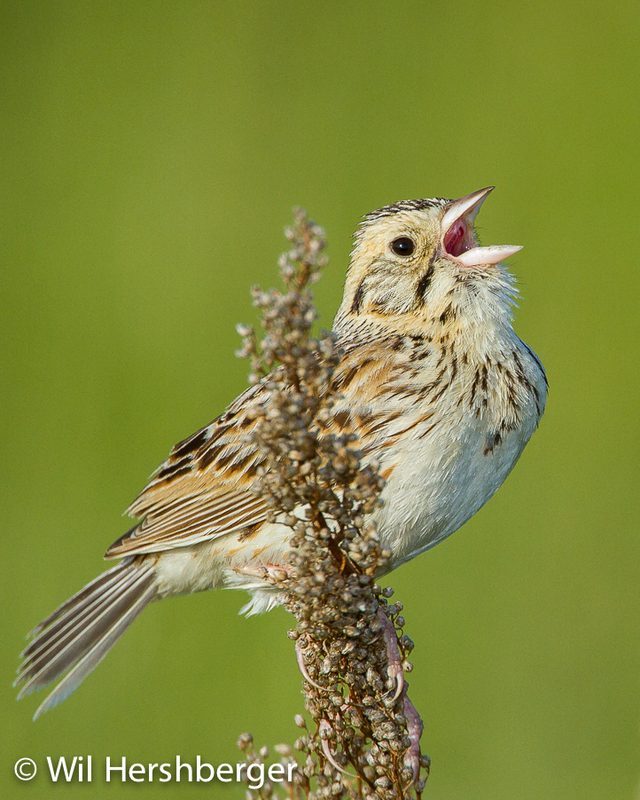 Baird’s Sparrows breed in the northern Great Plains where they prefer native short and mixed-grass prairies. Also, they require vary large fields where they can see for miles in any direction. They avoid edges and road tracks, they’ll even avoid well used two-track roads that run through otherwise pristine fields. Baird’s Sparrows seem to prefer fields that are idle or lightly grazed and have an intact litter layer of dead grasses from previous years. Their nests are built on the ground and concealed by dead and living vegetation. As with many species of grassland nesting birds, they land near the nest and run along the ground in “tunnels” created by the overarching plants. I was impressed by this male’s tolerance of me. After several minutes of slowly walking around in the field, trying to mimic the randomness of a grazing cow, I was within a few meters of him. He sat on his perch singing away and seemed to care less that I was there. With my parabolic microphone aimed at him, I was able to hear and record ever nuance of his quiet song. Other than a distant Bobolink, there was little else for him to compete with. Males sing from perches on the stems of grasses, forbs, and woody plants. His plaintive tinkling song doesn’t carry very far. In fact, it can be difficult to detect a singing Baird’s Sparrow from farther than 100 yards. He starts singing well before the sun rises above the eastern horizon with a slow and steady cadence that seems to perfectly fit the wide open spaces he calls home. Range-wide, there are about 13 different song types, though an individual male learns and sings only one of these song patterns. A male Baird’s Sparrow singing from a wide-open patch of native prairie in central North Dakota. June 17, 2014. ©Wil Hershberger. Conversion of native prairie to agriculture and housing developments is pushing this beautiful sparrow every closer to extinction. The animated map below shows the current breeding range for Baird’s Sparrow and the current population trend for this species as determined from the Breeding Bird Survey results. There are precious few blue areas (increased detection of singing males) on the trend map and far too much red (drastic reduction in breeding males detected). Perhaps the June 20th Presidential Memorandum to protect pollinators — all pollinators — including bees, butterflies, AND BIRDS, will lead to a reversal of this disturbing downward trend and once again we will be able to see and hear this vanishing jewel of the prairie. Thank you Melissa. They are becoming scarce. It is a real shame. I have seen some of the images that you made in the Dakotas and they are awesome. Thank you Lisa. I really love this species song. I wish it were easier to hear it in the field. Wonderful, Wil! Just a tad envious. I was in North Dakota a few weeks and looked in vain for this bird. Great work. Nice going Wil! Good catch – great recording – wonderful story. What an absolutely beautiful recording of such a delicate song!